FotonaTightSculpting is a unique dual-wavelength, non-invasive laser treatment for sculpting and skin tightening on all body areas. The exclusive delivery modes are used in concert for hyperthermic adipocyte destruction and collagen remodeling with exceptional results. The procedure is a fast, safe and effective non-invasive alternative to laser lipolysis. 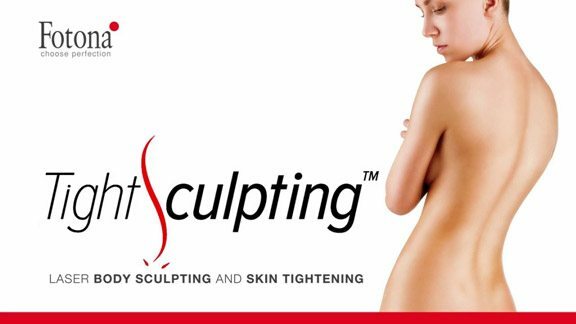 TightSculpting features dual-wavelength laser technology for skin tightening, cellulite reduction, and non-surgical body contouring. The second wavelength is a gentle fractionated er:YAG that causes an immediate contraction and tightening of the skin. By combining both of these wavelengths the TightSculpting procedure is able to achieve skin tightening results previously only achieved with surgery.